Congolese security forces have fired tear gas in and around churches to break up large protests against President Joseph Kabila. At least seven deaths and dozens of arrests were reported. Security forces in the Democratic Republic of Congo killed at least seven people on Sunday and at least one policeman died, as clashes broke out during a protest in the capital Kinshasa. Police and soldiers set up roadblocks amid a heavy security presence to block around a thousand people who defied a government ban. Dozens of people were arrested. Protesters are demanding that President Joseph Kabila publicly state he will not extend his power beyond a two-term constitutional limit. Kabila, who has been in power since the 2001 assassination of his father, Laurent Kabila, has not ruled out another presidential run through constitutional changes. Elections have been repeatedly delayed since Kabila's constitutionally mandated two-term limit expired in December 2016. They are currently scheduled for December 2018. Security forces fired tear gas in and around churches after Catholic activists called for protests after Sunday mass. Opposition parties, civil society, youth movements and about 150 Catholic churches support peaceful demonstrations. Officers shot dead two men outside the St. Alphonse church in Kinshasa's Matete district, Human Rights Watch's Central Africa director Ida Sawyer said. A police officer also died in the incident. Authorities had earlier shut down internet and SMS services and warned that any gathering of more than five people would be dispersed. Witnesses and churchgoers reported security forces firing tear gas and stun grenades at protesters gathered outside a number of churches in the capital. 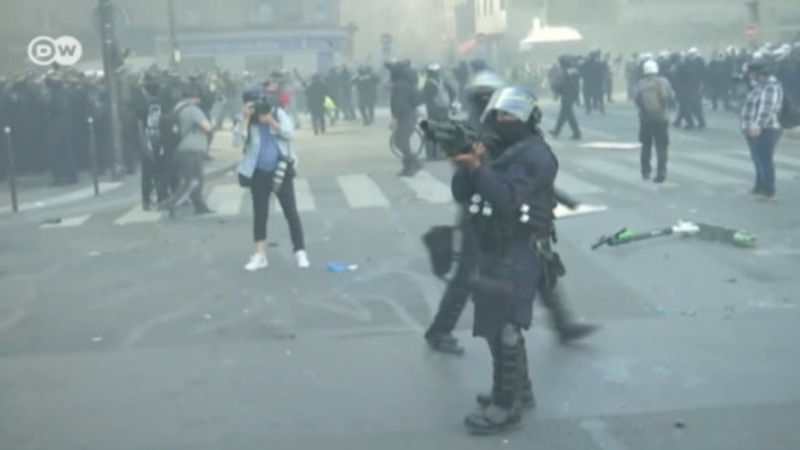 Opposition leader Vital Kamerhe told Reuters that security forces fired tear gas into the Paroisse Saint Michel during the mass he was attending. At the Notre-Dame of Congo Cathedral in Gombe, in north Kinshasa, security forces fired tear gas as opposition leader Felix Tshisekedi arrived, AFP news agency reported. Twelve altar boys dressed in their liturgical robes were also arrested at one church as they led a protest march. About half of the Democratic Republic of Congo's population is Catholic and the church is considered a respected institution by many. Elections were to be held by the end of 2017 under a church-mediated deal between the opposition and Kabila that was agreed a year ago. Deadly street demonstrations organized by the opposition since last December have left dozens dead, raising concern the country could plunge into greater political violence.